WHOEVER RECEIVES ONE CHILD SUCH AS THIS IN MY NAME, RECEIVES ME.. In our readings this Sunday, we hear of the sinful, jealous, prideful nature of man contrasted with the wisdom and gentle love of God in caring for his chosen ones. In our first reading from the Book of Wisdom (2:12,17-20), we hear of the wicked who put the "just one" to the test, eerily prophetic of the disdain the Jewish leaders had for Jesus. The evil designs of wicked people have always been with us. In our Gospel reading (Mark 9:30-37), Jesus, for the second time, predicts his passion and death. His disciples just don't understand. They argue instead about who among them will be the greatest. 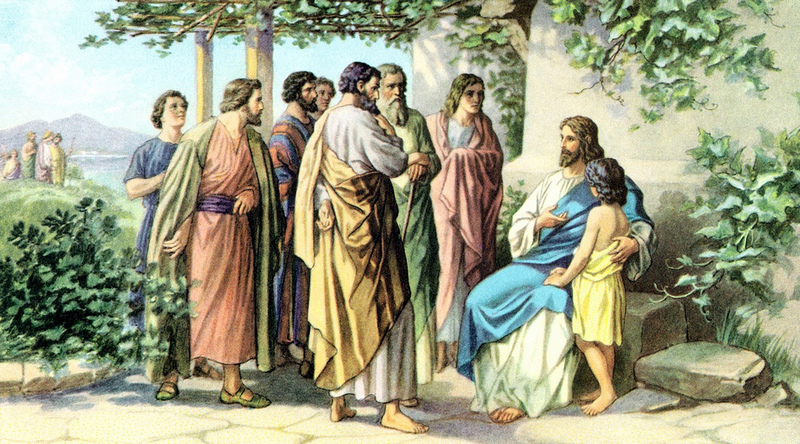 Jesus responds with further teaching about the nature of discipleship. He uses a lowly child as an example of servant leadership. Our Epistle reading (James 3:16 - 4:3), St. James calls out the wickedness and disorder that seeks to destroy us and offers the antidote - peace, gentleness and mercy. The futility of worldly wisdom vs. the "wisdom from above.". Over the next several weeks, we will hear Jesus' teaching on the nature of true discipleship. It began last week with "deny yourself and take up your cross and follow me". It continues this week with "If anyone wishes to be first, he shall be the last of all and the servant of all." This was, and is so contrary to the wisdom of this world. Here is an anonymous quote that puts it into perspective, "If you seek greatness, you will be disappointed. Rather, seek to serve others and greatness will find you." May we lose ourselves in the service of others.